On a lovely early summer evening, some fast-moving object slams into the moon and shatters it into seven major pieces, and an unknowable number of smaller ones. At first, there's surprise, fascination, and the longterm anticipation of Earth eventually having rings. But when the big pieces start crashing into each other and breaking up, it becomes clear the future is much grimmer. This is going to be a meteor storm to make life on Earth extinct. There are only a few years available to construct a solution that will preserve enough human life to to terraform and recolonize Earth--in a few thousand years, when the "hard rain" of the meteor storm and its aftermath are over. In space, the ISS becomes the focus of a major save-the-species effort. Dinah McQuarrie, leader of an asteroid mining operation, and Ivy Xiao, commander of the ISS, become leaders of that effort. This is a long, and complicated, book. I found it completely absorbing--somewhat to my surprise, as I've had my problems with Stephenson's work in the past. There are technical problems, human conflicts, and political problems. As the US and other space-faring nations cooperate to select young people to go up into space, and the days count down to the impending end of the world, the political problems include people who haven't been selected to be part of the "cloud ark" to save humanity storming the site of some of the launches. President Julia Bliss Flaherty orders a nuclear strike--and Ivy's fiancé Cal, a nuclear sub commander, is the one stuck pushing the button. Dinah converts her mining robots into construction and repair to convert the ISS into the center of a space colony. On that colony, at first called Izzy, and then later formally christened Endurance, conflicts arise between the "general population," the scientists, engineers, miners, and the others selected and sent up for special skills, and the "arkies," the young people selected for their likely ability to contribute to the survival and repopulation of the human race after the disaster. Much of this is old-fashioned hard sf of the kind I loved reading as a kid and teenager, without the 1950s social mores and backward view of anyone who wasn't white, male, and straight. 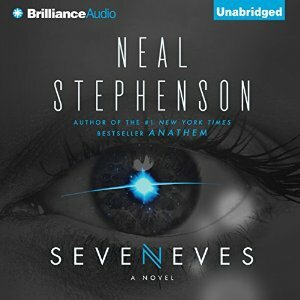 I will say that what Stephenson does with genetics is as much of a reach as the use of FTL in much hard sf and space opera--but equally, if you don't object to FTL in those contexts where it helps make a good story, there's no reason to object to the genetics in Seveneves. The story is told in three sections--pre-Hard Rain, while everyone works, together or in conflict, to cobble together the survival of the human race; post-Hard Rain, when the survivors in space struggle to make their largely improvised colony work; five thousand years later, when the descendants of the survivors are terraforming and preparing to recolonize Earth. During that last section, they discover that they weren't the only Save the Humans project in the face of the world-ending disaster. There are times when Stephenson goes on at more length than necessary about technical details. It's annoying, but the plot does keep moving and the character development is excellent. I do totally understand why this book has gotten such mixed reactions--and also why it's on the Hugo ballot for Best Novel. I received this audiobook as a gift from a friend.